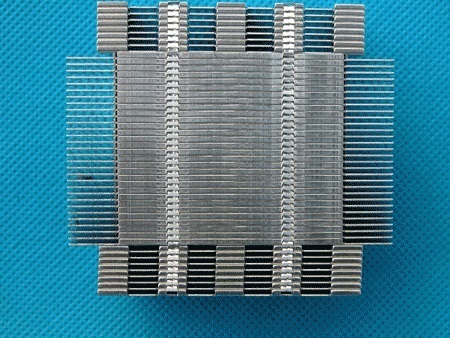 inated as a viable option due to the prohibitive expense of using them for heat sink manufacturing. Graphite foam is a newer technology for heat sink manufacturing, but doesn’t work well in most electronic devices because of the higher heat generated within them. This heat cannot be dissipated efficiently because of the high interfacial resistance due to the porous nature of the foam. So graphite foam is not a good choice for mainstream electronics, but has been useful in applications in industries such as aviation and aerospace where low cost and ease of use is more important than performance. Copper is the only rival for aluminum in heat sink manufacturing. For most applications, engineers will prefer lighter weight and lower cost over better thermal connectivity, which makes aluminum the best material for heat sinks. Want to know more about our extruded aluminum heat sink manufacturing process? Check out our aluminum heat sink turnkey manufacturing page on our website.